Between the lavender fields and now antelope canyon, I am starting to think my bucket list is purely inspired by desktop background images. Regardless, visiting early Lower Antelope Canyon was a huge check off the list for both my little sister and me. We drove in from Phoenix the night before our reservation with Ken's Tours after visiting Sedona (seen here). I have to admit that none of the accommodations in the Page area fall into the luxury travel category, except of course Amangiri which is just over the border in Utah. Instead, I booked an affordable one night stay at the Lake Powell Resort. The rooms are similar to a Holiday Inn Express and the views are absolutely unmatched (see here). 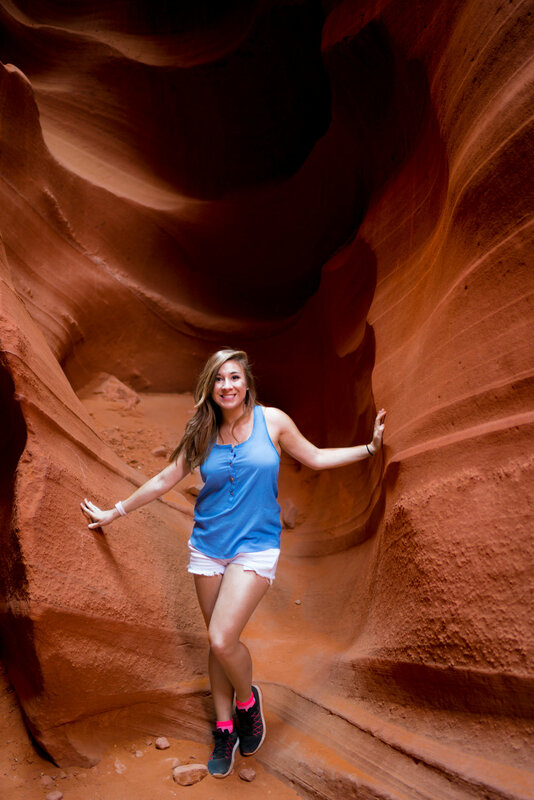 The resort put us an easy 20 minutes away from Lower Antelope Canyon which is centrally located in Page, AZ. We booked a 9:00 AM reservation with Ken's Tours per recommendations on TripAdvisor. In the summer, they will cancel any tours as soon as the temperature reaches 100 degrees for your safety, so it is important to book an early tour. You will have to wait at least 30 minutes plus to enter the canyon as the guides wait for other groups to exit the canyon. Also, the light that the Lower Antelope Canyon is famous for occurs around 10:00 AM in the summer, or closer to noon the rest of the year. Another thing to note is that they do not offer photography tours in the summer, which means you will not have as much time to take pictures. This means you cannot bring tripods or plan photoshoots during this time. Obviously, I was able to get plenty of photos, but the guide was definitely trying her best to politely move me along. It is important to pay attention to the guidelines for reservation which require reconfirming your appointment 24 hours prior and arriving at least 30 minutes prior to complete check in. Be sure to bring cash for the reservation for faster check in. Also, note that there is a park entrance fee in addition to the tour guide cost and it is recommended that you tip your guide at the end. Remember to wear comfortable shoes, like hiking boots or tennis shoes and don't bring to much stuff with you. At the beginning you have to walk down a very steep stairwell one by one into the canyon. There was a family in front of me that had a baby and like four shopping bags (from where I have no idea) who definitely struggled with this task. After that the trail is narrow and flat. I think I spent the whole time looking up because the light in the canyon is truly stunning. The guides were really helpful in taking pictures because they know all of the important shots and what settings to use. Some guides are helpful with which settings to use on DSLRs, but others like my guide were more experienced with the iPhone. On the iPhone, the recommendation is to use the Chrome filter which is found in the camera settings to bring out those purple hues in the shadows. For DSLRs, it's just important to shoot in RAW and set your ISO really high since the camera will need to perform in varying and low light conditions. My Sony A7RII is perfect for low light situations so I think the photos came out well, but I do wish I would have had more time to steady my shot to ensure sharper images. If you are wondering if the canyon really looks like these photos the answer is yes and no. The light is truly beautiful bouncing off the canyon walls and the colors you can see are shades of red, orange and gold. However, the purple is brought out in the shadows in post processing and the guides can point out which scenes are best for exposing this color. I loved my experience here, it is a must visit if you are in Arizona or Utah. After our tour we went straight to nearby Horseshoe Bend (seen here) which is another must see, followed by lunch at Big John's Texas BBQ in Page, and finally on to the Grand Canyon!